Whisk together the flour, cornstarch, salt, cayenne, paprika, and black pepper in a large mixing bowl; transfer ¾ cup of mixture to a rimmed baking sheet. Add baking powder to the bowl and whisk to combine. In a heavy-bottomed Dutch oven, heat the oil over medium-high heat to 375 degrees. Meanwhile, thoroughly dry the fish with paper towels and dredge each piece in the flour mixture on the baking sheet; transfer the pieces to a wire rack, shaking off excess flour. Add 1¼ cups of beer to the flour mixture in the mixing bowl and stir until the mixture is just combined (the batter will be lumpy). Add the remaining beer as needed, 1 tablespoon at a time, whisking after each addition, until the batter falls from the whisk in a thin, steady stream and leaves a faint trail across the surface of the batter. Using tons, dip 1 piece of fish in the batter and let the excess run off, shaking gently. 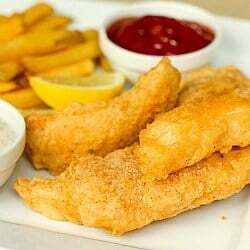 Place the battered fish back onto the baking sheet with the flour mixture and turn to coat both sides. Repeat with the remaining fish, keeping the pieces in a single layer on the baking sheet. When the oil reaches 375 degrees, increase the heat to high and add the battered fish to the oil with tongs, gently shaking off any excess flour. Fry, stirring occasionally, until golden brown, 7 to 8 minutes. Transfer the fish to a thick paper bag or paper towels to drain. Serve with your favorite French fries.